Yesterday afternoon I planned out a whole new sheet of temporary tattoo paper, ready to print out and apply some last night. But of course I ran out of printer ink just as I was printing the test page! I was so psyched to wear one of the new designs and then I wasn't able to. So I had to go to my untried drawer and find something pretty to wear. The one colour that was guaranteed to pep me back up is gold, and gold glitter is even better. This is Color Club Gingerbread from their Holiday Splendor collection last year. 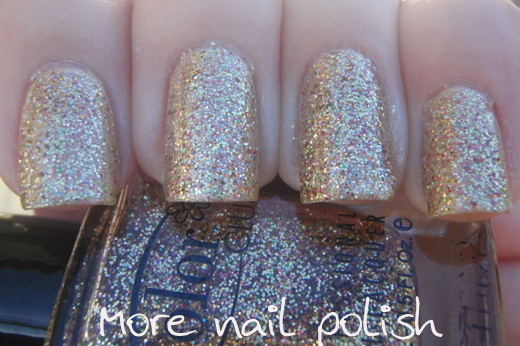 It is a light gold polish with lots holographic sparkles. I layered two coats of Gingerbread over Periperia Crystal Gold. 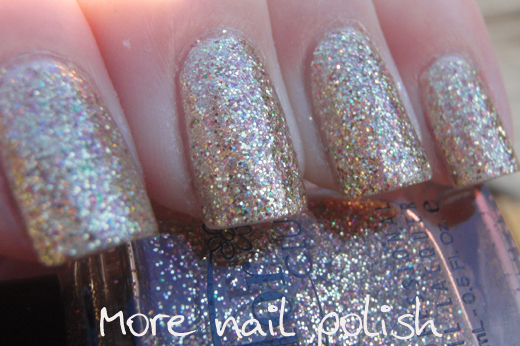 I wish I knew why it was so hard to photograph amazingly blingy glitters like this. As you can see, it's not just gold glitter in this, there is a huge array of different coppery and bronze glitters too. I can also seen light green in this shot, but that might be the gold holo?? I love this glitter so much, mainly because it's a cool toned light platinum gold glitter and not warm orange looking gold. This is only the second polish out of the Holiday Splendor collection I've tried and they are both amazing. The bottles of the others looks like they will be awesome too. I'm so glad I grabbed this collection! I have this one sitting untried ... I might have to drag it out!